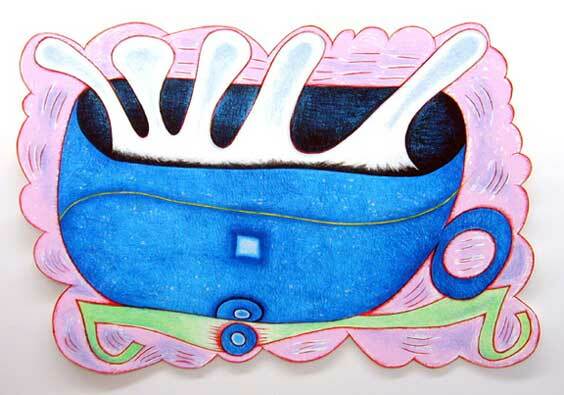 Much of Elizabeth Murray’s artwork references domestic still lives: coffee cups, utensils, furniture, eggs over easy. But as David Hickey noted in his 2005 essay about her printmaking at Gemini G.E.L., these still lives “are anything but still.” Her artwork is a “kind of graphic cubism” that expands beyond the traditional framework that had once contained the biomorphic inventions of Joan Miro, the riotous color of Henri Matisse and the fractured representations of Pablo Picasso. Trained as a painter, first at the Art Institute of Chicago and then at Mills College in Oakland, California, Murray headed to New York after completing her MFA. She first gained acclaim as one of the featured artists in the annual exhibition Contemporary American Painting held at the Whitney Museum of American Art in 1972. Over the years, she has held sixty solo exhibitions including a retrospective at the Museum of Modern Art in 2005. In 1999, she was awarded the MacArthur Foundation “genius” award. Murray’s shaped canvases literally explode from the wall as passionate and enthusiastic translations of the everyday made extraordinary. Her pieces are not windows into an illusionistic two-dimensional space but rather they are the actual spaces where her invented objects exist. They suggest a conflation of cartoon-inspired surrealism (think Max and Dave Fleischer, the creators of Betty Boop and Popeye) and 1960s Pop Art but with much more attention to gesture and surface. Similarly, her work on paper will not be constrained by the limitations of the rectangle, often resulting in her decision to cut and construct the image into shapes that further define the composition. In this print, The Deep Blue C, the artist might simply be referring to the blue cup that dominates the composition but she also might be drawing our attention to the tidal motion of rocking and reeling that results in what can best be described as whitecaps erupting from that cup. That palpable energy is barely contained within the print itself, which is circumscribed by a scalloped pink doily, plate, placemat, tablecloth or even table top, beneath the “C.” This domestic scene of morning coffee or afternoon tea is far from tranquil. Murray’s comical depiction of this tempest in a teacup seems to acknowledge the underlying tension and anxiety of modern domesticity and the inherent possibility of psychological crisis.